The stock market's wild behavior, with Wednesday's big swing up and Thursday's sell off and then late rally, could be the start of a bottoming process for stocks. Technicians are debating whether the market has seen its low yet, but they do say it may need to retest it at some future point that could be weeks or months away. "It's too late to become bearish, and it's too early to become bullish," said one strategist. Traders work on the floor of the New York Stock Exchange (NYSE) in New York, U.S., on Friday, Dec. 7, 2018. That time frame coincides with the run up to major events that strategists say could be fundamental catalysts for the market. One is the March 1 deadline in the trade talks between the U.S. and China, and any resolution of trade issues could be a positive. The other is the Federal Reserve's March 20 meeting where the Fed is expected to consider raising interest rates, but the market is betting the Fed instead could pause, a positive for stocks. 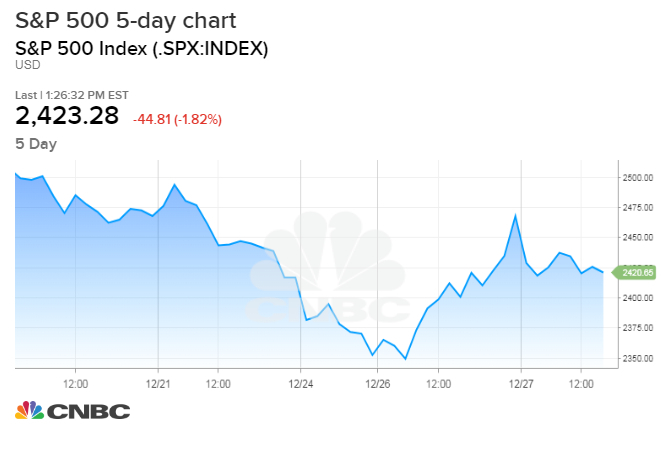 The stock market's wild swings this week, including the more than 1,000-point surge Wednesday in the Dow followed by Thursday's sharp declines and bounce back, are signaling the market could be hunting for its lows. Technicians are debating whether the end is near but agree there could be other sharp swings higher and rallies before the market bottoms out. "If you look at major bottoms through history, they all required some double bottom. We don't' have that yet. It's still kind of the first leg of the 'W,'" said Ari Wald, Oppenheimer technical analyst. "Usually you need some price consolidation. We've been watching 2,375 [on the S&P 500]. We went below it temporarily on Monday, then went back above it. 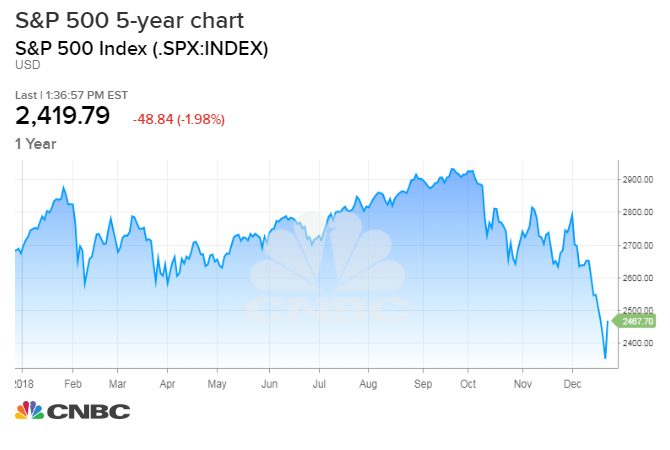 It's the 50 percent retracement of the bull market since 2016." "Just how stretched we are to the downside, you can see with these big moves to the upside. It's too late to become bearish, and it's too early to become bullish," he said. "We think magnitude-wise, this is consistent with what a cyclical bear market looks like in a secular bull market We think we hit enough of the magnitude, but not enough duration. We still need a base," Wald said. "You're going to get over sold reflex bounces. You want to see a test of the law and that base is going to be tested in weeks, not days." "We think what is especially bothering the market is global trade. It's probably the biggest concern because it has the greatest possibility of starting a global recession," said Sam Stovall, chief investment strategist at CFRA. "Another worry is the Fed and how aggressive they're going to be with their rate tightening policy and third is the total dysfunction in Washington." If there is a positive development that changes the tone for stocks, Monday's close could have been the low, Stovall said. "The more difficult question is whether [Wednesday's] move is just a rally in a downtrend or the start of a major low taking shape. The jury is out, but either way, we'd at least expect follow through over coming weeks. Resistance comes into play in the 2,600 to 2,675 range (roughly +10% to 15% from the lows)," notes Chris Verrone, technical strategist at Strategas Research. "Rallies of similar magnitude are not uncommon in bear market environments, but the tricky part is the timing and duration of the move. 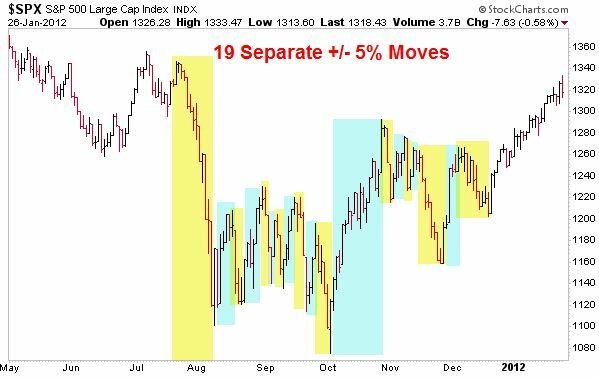 Major lows often exhibit overwhelmingly strong breadth and momentum." Frank Cappelleri, executive director at Nomura's Instinet, said the current sell off has been hard on the technical sign posts everyone has been watching. "Clearly yesterday's low of 2,346 is on everyone's radar screen now. Every other retracement level, or moving average, long term support zone, has not mattered at all on the way down. In the very least, we have a short-term reference point," Cappelleri said. "We've been through multi-months of this before, most recently 2011/2012 where you had a low somewhere in the middle of the price action – October of that year, but didn't get any type of clarity until two months later," Cappelleri said. "I don't think anyone is too comfortable buying or selling at this point … It's just one of those things that momentum and volatility are going to be here until it's not. It's very difficult to time it and make sense of exaggerated moves. Talking about comparisons to 2008 and the 1930s is a little disconcerting." "We haven't seen that yet. You need to see more two-way action. It's been decidedly to one side, the negative side right now," he said. "The biggest moves occur in bear markets. You need to see some semblance of buying interest. You need to see tug-of-wars. I think at the very least, there was the indication of that starting yesterday." "What I've learned over the years is nobody knows where the market is going ... You can make money in the market not by knowing what the market is going to do but having a process. Technical analysis is a process," he said. He said just 8 percent of the S&P 500 companies are above their 200-day moving average, the lowest amount since 2011, when there were just 7 percent above. "We still think we're in this secular bull market that's going be led by high growth companies in a low growth world. It's stocks like Apple and Microsoft, you will get those losses back eventually. I'm much more worried about stocks with global and commodity exposure, like energy, industrials and materials," he said. 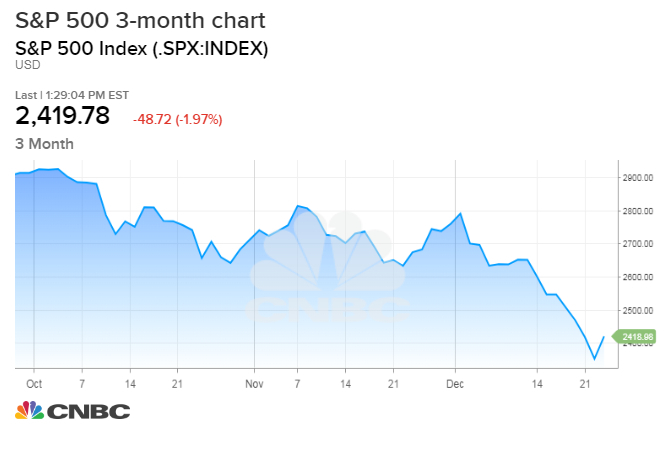 Bruce Bittles, chief investment strategist at Baird, said the pessimism from the market's half-day Christmas Eve bloodbath, where the Dow lost more than 600 points, was the sign of a possible step toward a bottoming. "We do think the decline on December 24 caused pessimism to soar, which is one of the requirements we are looking for to identify the start of the bottoming process. We anticipated the VIX jumping to 35 and that was fulfilled on Monday but historically all serious declines have the VIX stretched much higher. As a result, additional data is necessary for confirmation that the lows could be in place but we remain skeptical," Bittles said in a note.